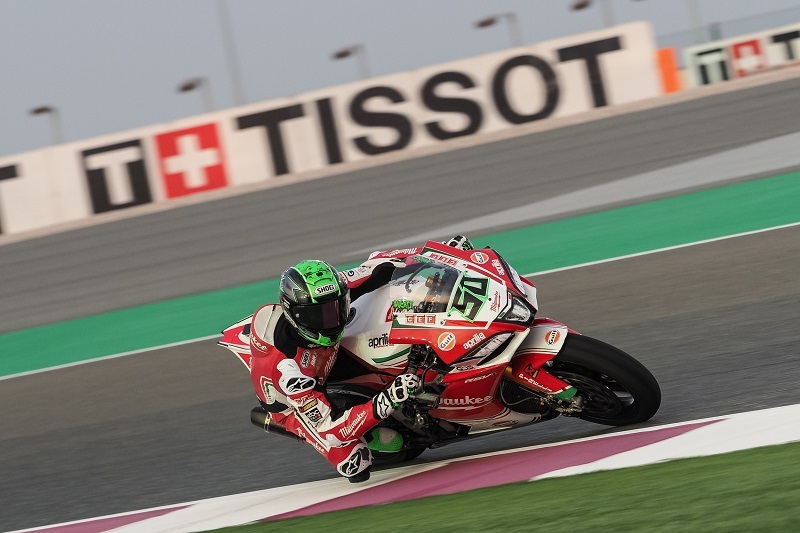 Eugene Laverty (Milwaukee Aprilia) completed a brilliant first day at Losail International Circuit, taking first position in the combined Free Practice timesheets. The final round of the MOTUL FIM Superbike World Championship gets underway in Qatar with the Irish rider showing his full potential, having managed to beat both Jonathan Rea (Kawasaki Racing Team WorldSBK) and Tom Sykes (Kawasaki Racing Team WorldSBK) in the final minutes of FP3. Both KRT riders had finished outside the top two in the second session and returned to the track determined to recover their advantage under the Qatari floodlights. First it was Sykes who moved into the lead inside the opening ten minutes; Rea followed fifteen minutes later, inching ahead by just 30 thousandths of a second. Sykes would tighten the gap further in the dying stages of FP3 to just eight thousandths of a second. But it was Laverty who managed to steal the top spot one minute before the chequered flag came down, setting a fastest lap of 1’57.323, nearly two tenths of a second faster than the two ZX-10RRs. After also topping FP1 and getting pipped to P1 by just 0.025 seconds in FP2, the Irishman seems set to leave his mark on the final round of 2018. Alex Lowes (Pata Yamaha Official WorldSBK Team) completed the front quartet, although he was unable to improve upon his best FP2 time. Topping the second session earlier in the evening, the Englishman seems set to end his season on a high at Losail. Lorenzo Savadori (Milwaukee Aprilia) was fifth fastest on Thursday, moving inside the top spots at the end of the third practice. He moves into tomorrow’s Superpole 2 ahead of Loris Baz (GULF Althea BMW Racing Team), sixth fastest in Qatar. In the final round of the Panigale R before its four-cylinder brother arrives next season, Marco Melandri (Aruba.it Racing – Ducati) was only able to finish seventh fastest, with teammate Chaz Davies (Aruba.it Racing – Ducati) in ninth and Xavi Fores (Barni Racing Team) twelfth in the other red machine, with the independent riders champion forced to battle his way through Superpole 1 on Friday. Michael van der Mark (Pata Yamaha Official WorldSBK Team) seemed destined for that first qualifying shootout after crashing in FP1 and struggling through FP2 and most of FP3; however the Dutchman found some late form in the closing session and recorded the eighth fastest time for the day. Closing the top ten for Free Practice was Toprak Razgatlioglu (Kawasaki Puccetti Racing), the Turkish rider extending his good momentum into the Pirelli Qatar Round as the top independent rider on Thursday. Leandro Mercado (Orelac Racing VerdNatura) however fell just short of the Superpole 2 positions in eleventh, as did both Red Bull Honda World Superbike riders (Jake Gagne 13th, Leon Camier 14th). That’s a wrap for today, but there’s plenty more coming tomorrow! Tune in for the final Superpole sessions of the year at 16:30 local time (13:30 GMT).